At the risk of stating the abundantly obvious, the incongruity (to put it mildly) of aborting the same age baby that is tenderly, lovingly cared for by a “SWAT team” of devote specialists is hard to ignore—or understand. Babies whose lives everyone is desperately trying to save could have been—and are—aborted. Bear in mind these little ones are sensitive to pain. Of course, some babies are born so early that not even the most skilled hands can save them. Kluger’s account of the care with which the hospital prepares parents for the end tells us that their baby has been respected and that his or her life, however brief, mattered. “More and more, however, the life is saved, the baby does come home, and there are plenty of sunny days and starry night ahead. In some way, the work of a NICU will always seem like an exercise in disproportion—an army of people and a mountain of infrastructure care for a pound of life. Yes, it speaks very well of us. Each baby matters. Each baby deserves our greatest effort. And by so doing, we are collectively a more caring and decent people. We believe that every baby—born and unborn, “wanted” and “unwanted”—deserve what some would consider a disproportion amount of love and affection and, most of all, protection. If we won’t do it for them, who will we do it for? I was born in 1976, three months early and weighed right around 2 lbs. The doctors gave me a 50/50 chance. They called me a “miracle baby”. I have cerebral palsy, vision and hearing deficiencies, but I survived because my parents and the many teams of doctors never gave up on me. My parents hadn’t chosen a pediatrician at that early point, so one was provided by the hospital. She was Chinese and spoke very little English. She was by my side all the time. My parents knew that this devotion must be very expensive. When they asked how much she charged, she said, “Twenty five.” And that was all she ever charged per office visit….$25. 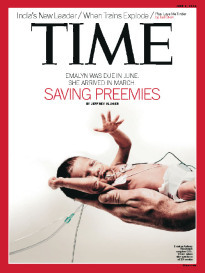 God bless her and all those who choose to work with preemies. Thank you!